The allure of gold and silver is something that has proven to be timeless. No matter the circumstances or location, gold/silver has always held some discernable value. As such, an increasingly popular mode of investing in recent years is that of precious metals trading. Gold remains the most popular investment because of its durability and many industrial uses. New supplies of gold from mines are limited, but there are still some enormous gold mines around the world that are producing this precious metal. Here are the top five according to 2014 disclosed production numbers. This is a very secretive gold mine in Uzbekistan that is considered by most to be the largest gold mine in the world, producing upwards of 2 million ounces of gold per year. Navoi runs the mine, and its exact production numbers are treated as a state secret; however, they still have an incredible degree of untapped resources here. The Grasberg gold mine is located in the Papua province of Indonesia and is thought to be the world’s largest gold mine regarding contained gold. Not only is this the second-largest gold mine in the world, Grasberg is also the third-largest copper mine. 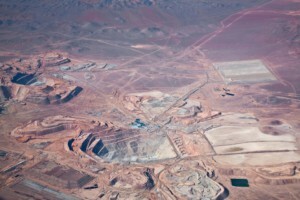 The mining operation, operated by Freeport-McMoRan, is laid out in terms of an open pit and two underground mines, which produce a combined 1.1 million ounces of gold per year. Located in the Dominican Republic, in the Azua Province, this gold/silver mine seems to be just getting started. Owned by a joint venture between Gold Corp and Barrick Gold, the mine achieved full-scale gold production in 2014 of 1.1 million ounces and is expected to have a 25-year mine life. The mine has an open pit, where it exploits gold resources from two major deposits and three minor ones. Located in northern Peru, Yanacocha is considered to be the fourth largest gold mine in the world, and the mine reached its peak production in 2005 with over 3.3 million ounces of gold produced. Owned by Newmont Mining, this operation hasn’t been without its troubles such as environmental, corruption, and other legal issues. With all of this seemingly behind them, the mine is now producing close to 1 million ounces of gold per year. The Carlin Trend gold mine is the one mine on our list that is U.S.-based. Located in Eureka County in Northern Nevada, this mine began producing gold in 1965 and has produced more gold than any other mining district in the United States. The mine is also owned by Newmont and produces just under 1 million ounces of gold per year. The Carlin Trend mine uses both underground and open-pit mines and is continuing to expand to new ore deposits. These colossal gold mines each produce an incredible amount of gold each year. For those interested in precious metals trading, learning about gold/silver mines and the firms behind them can be both interesting and beneficial. Investing in precious metals is not only fascinating, but it is also the ideal way to diversify a portfolio, reduce risk, and accumulate wealth over the long term.